Higher Education Wales, the Higher Education Funding Council for Wales, and the Welsh Government commissioned Elsevier to assess the performance of the Welsh research base when compared to the other UK constituent countries (Scotland, England and Northern Ireland) and research countries of comparable size (Belgium, Denmark, Finland, Ireland, Norway and New Zealand). It tracks investment in, and performance of, the Welsh research system in an international setting, combining a variety of indicators to present a multifaceted view of the Welsh comparative performance in research as well as the trends that may affect its future position. 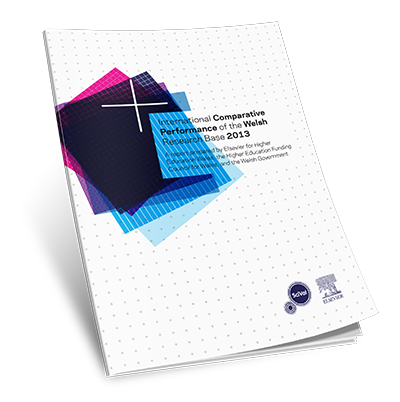 The report, 'International Comparative Performance of the Welsh Research Base – 2013,' is the first report to focus solely on Wales, after two similar reports commissioned by the UK Department of Business, Innovation and Skills for the UK research base, to be delivered by Elsevier. Whilst the report shows that Wales “punches way above its weight” in terms of research income compared to research outputs, efficiency and impact, there are concerns regarding the sustainability of this strength, as input variables such as researchers and GERD show little and even negative growth.